2019 Mercedes Benz CLA Class Trim Levels with Comparisons & Configurations. What 2019 Mercedes Benz CLA Class Trim Level Should you Buy? What is the Difference Between Trims? The CLA-Class is one of Mercedes-Benz’s most affordable vehicles. However, this compact luxury sedan still promises to reward you with an upscale driving experience. While the base model is entertaining enough for most people, true driving enthusiasts will desire the high-performance AMG model. A number of attractive features now come standard. 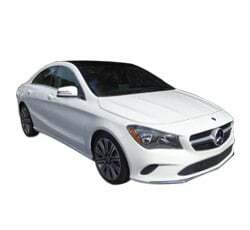 Although the new 2019 Mercedes-Benz CLA-Class is comfortably daily-driver, be aware of its small backseat and a stiffer than average ride. Let’s find out what you get with each trim. Compare the 2019 Mercedes Benz CLA 250 vs AMG CLA 45 Trim Levels. What is the difference? The CLA 250 trim will be the preferred choice of most drivers. With an MSRP of $33,100, it proves to be a legitimate bang for the buck. You’ll be able to ride in luxury without paying a lavish price. Powering the Mercedes-Benz CLA 250 is a turbocharged four-cylinder engine, which develops 208 horsepower and a healthy 258 pound-feet of torque. A seven-speed automatic transmission routes power to the front wheels. You should be able to hit 60 mph in around 6.8 seconds. Although premium gas is recommended, fuel economy estimates stand at an impressive 24 mpg in the city and 37 mpg on the highway. An ECO start/stop system helps minimize fuel consumption in traffic. Mercedes-Benz’s effective 4Matic AWD system is available as an option. You can also equip the CLA 250 with an adjustable suspension, which enables you to fine-tune the sedan’s driving character. From an appearance standpoint, the CLA 250 trim certainly doesn’t look like the typical base model. Its coupe-like design will catch the attention of many car shoppers. Of course, everyone will notice the sedan’s bold Mercedes-Benz emblem within the front grille. You can choose from a total of nine exterior colors, including favorites like Night Black and Mountain Grey Metallic. Mercedes-Benz gives you access to two different appearance packages. The blacked-out Night package adds a more striking set of 18-inch wheels with black accents. Meanwhile, a racy body kit and painted brake calipers come with the AMG Line package. On the inside, the Mercedes-Benz CLA 250 has the look and feel of a high-end luxury car. Its craftsmanship is on par with the best in the segment. Although genuine leather upholstery doesn’t come standard, Mercedes-Benz’s MB-Tex material impresses with its quality feel. Sport front seats with adjustable cushion length help keep you supported throughout the day. Dual-zone automatic climate control also comes standard. An optional Interior package brings leather upholstery and ambient lighting. You’ll find plenty of high-tech goodies inside the CLA 250. Featuring an 8.0-inch infotainment screen with a central controller, Mercedes-Benz’s COMAND infotainment system has received high marks for its easy-to-use design. Bluetooth technology enables hands-free calling and music streaming from your smartphone. Other notable features include a backup camera, HD radio, and dual SD card slots. If you desire Apple CarPlay and Android Auto, purchase the Smartphone Integration package. Music fans should consider getting the optional Harman Kardon audio system, which sounds especially powerful. Navigation is available as well. For an extra $1,800, you can upgrade the CLA 250 with a Premium package. While the heated front seats bring more warmth on cold mornings, blind-spot monitoring enables you to feel more confident on the highway. Fortunately, Mercedes-Benz equips the CLA 250 trim with some helpful safety technologies. While the forward collision system automatically triggers the brakes when approaching unnoticed road hazards, drowsy driver monitoring makes sure you don’t fall asleep at the wheel. You’ll also benefit from an emergency communications system. You can bolster your on-road security with the optional Driver Assistance package. It includes adaptive cruise control, which seamlessly responds to the flow of traffic. Lane keeping assist also comes with the Driver Assistance package. Folks who desire a more stimulating drive should step up to the more powerful AMG CLA 45 trim. However, the sedan’s price climbs to $53,100. Its handcrafted, turbo-boosted four-cylinder engine is rated to produce an exciting 375 horsepower and 350 pound-feet of torque. Although the AMG CLA 45 features a similar seven-speed transmission, engineers tweaked it to be more responsive. A scorching 0-60 time of 4.1 seconds highlights the AMG CLA 45’s quicker acceleration. However, fuel efficiency does drop to around 23 mpg in town and 30 mpg on the highway. A 4Matic AWD system comes standard. To enhance the AMG CLA 45’s sporty road manners, Mercedes-Benz equips it with some additional performance goodies. When cornering, a torque-vectoring differential and a sports-tuned suspension help keep the sedan balanced. Meanwhile, upgraded performance brakes help ensure quick stops at high speeds. Performance tires further aid the sedan's athleticism. Drivers will also enjoy the AMG CLA 45’s sport exhaust system, which sounds especially mean. For drivers who want to take the sedan’s handling to the next level, Mercedes-Benz offers the AMG Dynamic Plus package. It comes with an exclusive Ride Control suspension, which can be adjusted for your preferred driving style. Meanwhile, an AMG limited-slip front differential further improves body control. Along with the package come a raised top speed and a Race driving mode. When doing a side-by-side comparison of the CLA 250 trim and the AMG CLA 45 trim, you will instantly notice the AMG CLA 45’s more aggressive look. It features a standard body kit and a more menacing front fascia. You’ll also like the AMG CLA 45’s larger 19-inch wheels, which elevate the sedan’s sporty appearance. Like the CLA 250, the AMG CLA 45 is eligible for a Night package. This package outfits the sedan with several black-out styling cues, including black chrome tailpipes. Simulated suede upholstery inserts help give the AMG CLA 45 a cooler look on the inside. The CLA 250’s optional Harman Kardon sound system comes standard on the AMG CLA 45. Some race-inspired interior features are available for the AMG CLA 45. An optional sport steering wheel helps inspire confidence when maneuvering on twisty roads. If you want to give the interior a more luxurious feel, check out the AMG "Red Cut" package. It adorns the cabin with black “Red Cut” leather upholstery and red seat belts. Special dash and door trim is also included in the AMG “Red Cut” package. In regard to standard features, the AMG CLA 45 is equipped similar to the CLA 250. Some of the same options are available as well, including the Driver Assistance safety package and the Smartphone Integration package. With only two trims in the lineup, the 2019 Mercedes-Benz CLA-Class enables you to easily make a decision. However, there are several tempting packages available. Drivers who aren’t interested in any upgrades will be more than satisfied with the base CLA 250. Its turbocharged engine develops a good amount of power while still managing to keep fuel consumption low. The optional 4Matic AWD system is a must for driving in the snow. You’ll also enjoy the CLA 250’s luxurious-looking interior. Mercedes-Benz’s MB-Tex upholstery looks and feels great. Highly desired features, like the COMAND infotainment system and automatic emergency braking, come standard. To get the most benefit from the COMAND infotainment system, it’s a good idea to get the Smartphone Integration package. Simply add an extra $350 to the sedan’s total cost. Although the Driver Assistance safety package does create a more relaxing ride, you can save $1,500 by going without it. While the AMG CLA 45 trim is exciting to drive, you’ll have to spend at least $53,100 before even adding any options. Its specially tuned engine will definitely get your adrenaline pumping. Although the more powerful AMG CLA 45 trim obviously guzzles more fuel, driving enthusiasts will not complain about getting a combined 26 mpg. Before buying the AMG CLA 45’s optional Dynamic Plus performance package, be sure you really need it. This package is more appropriate for the drivers who intend to occasionally hit the track. Mercedes-Benz’s COMAND infotainment system is a joy to use. Aside from boasting crisp graphics, the interface comes with a useful controller knob. The main downside is you’ll have to pay an extra $350 in order to get Apple CarPlay and Android Auto smartphone support. If you’re a music fan who has some extra money to spend, don’t hesitate to get the optional Harman Kardon premium sound system. You’ll appreciate the unit’s clear sound reproduction. It comes with a total of 12 high-quality speakers, which can handle a lot of bass. The 2019 Mercedes-Benz CLA-Class offers some innovative safety features. Luckily, its most helpful driving aid comes standard. Drivers will truly appreciate the automatic emergency braking system. It does a good job of anticipating the likelihood a crash. Although blind-spot monitoring is an extra cost, you won’t regret your decision to get the system. When using the blind-spot monitor, the sedan’s sloping roof becomes less of an issue.